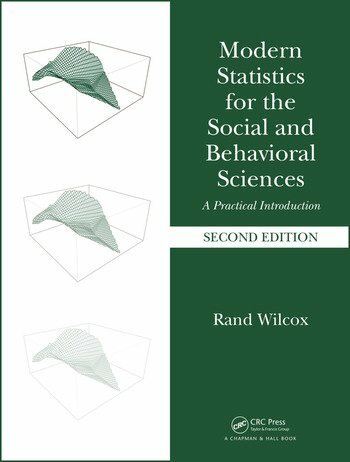 Requiring no prior training, Modern Statistics for the Social and Behavioral Sciences provides a two-semester, graduate-level introduction to basic statistical techniques that takes into account recent advances and insights that are typically ignored in an introductory course. Hundreds of journal articles make it clear that basic techniques, routinely taught and used, can perform poorly when dealing with skewed distributions, outliers, heteroscedasticity (unequal variances) and curvature. Methods for dealing with these concerns have been derived and can provide a deeper, more accurate and more nuanced understanding of data. A conceptual basis is provided for understanding when and why standard methods can have poor power and yield misleading measures of effect size. Modern techniques for dealing with known concerns are described and illustrated. This second edition describes many recent advances relevant to basic techniques. For example, a vast array of new and improved methods is now available for dealing with regression, including substantially improved ANCOVA techniques. The coverage of multiple comparison procedures has been expanded and new ANOVA techniques are described. Rand Wilcox is a professor of psychology at the University of Southern California. He is the author of 13 other statistics books and the creator of the R package WRS. He currently serves as an associate editor for five statistics journals. He is a fellow of the Association for Psychological Science and an elected member of the International Statistical Institute. What is a Measure of Location? When Is It Safe to Conclude that Two Variables Are Independent? REGRESSION: WHICH PREDICTORS ARE BEST? When Does the Paired T Test Perform Well? Rand Wilcox has been a Professor of Psychology at the University of Southern California since 1987. He received his Ph.D. from the University of California, Santa Barbara in 1976. His research interests are statistical methods, particularly robust methods for comparing groups and studying associations. He also collaborates with researchers in occupational therapy, gerontology, biology and psychology. He is the author of four books.